Let's discuss your requirements and commision a jewellery piece to your satisfaction. If you have an idea for an item of jewellery, please do contact me. I am happy to discuss any commissions and work within your budget to create the jewellery you desire. A customer inherited some old unwearable jewellery which was of great sentimental value to her. She wished to have these items and a few of her own melted down and reworked into 6 staking rings : 4 gold and 2 silver rings. 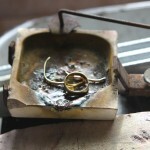 First the gold is tested and sorted into the relevant carat. (There were two carats – 18ct and 9ct.) 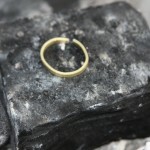 The gold is then melted in a crucible and poured into an ingot. The small gold bar is then rolled through a mill to produce a precise long slim rod. This rod is cut into lengths and each length is carefully shaped into a ring. 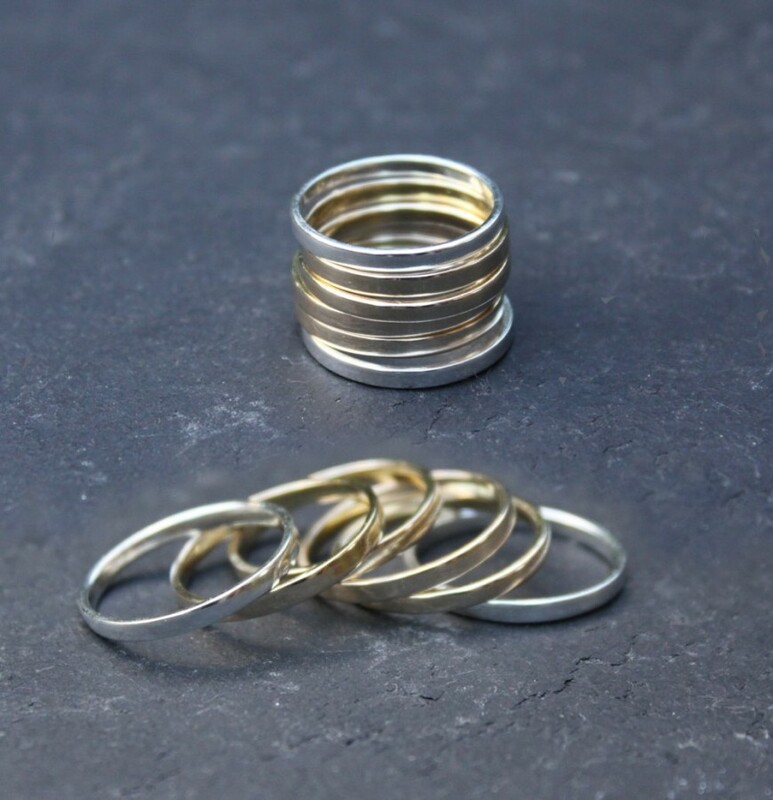 The same procedure was followed for the 9ct gold and the two silver rings. A client had a beautiful old sterling broach inherited from her aunt. She unfortunately had never worn it as she felt a broach did not suite her. It was a simple procedure to remove the pin from the back, drill two small holes and attach two sterling silver loops with a sterling chain. 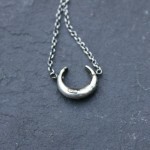 The client was delighted at the simple alteration that gave her a delicate and usable necklace. A customer had seen one of the necklaces I had created and she commissioned me to make one for her in slightly different colours. 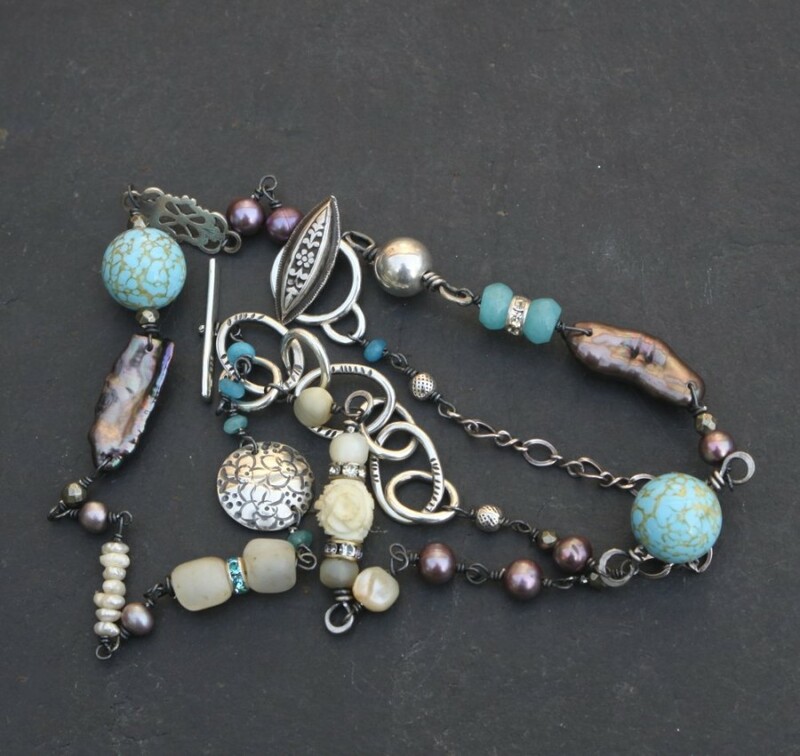 This necklace is a fusion of new and old. It is sterling silver, with the chain links and clasp handmade by me. 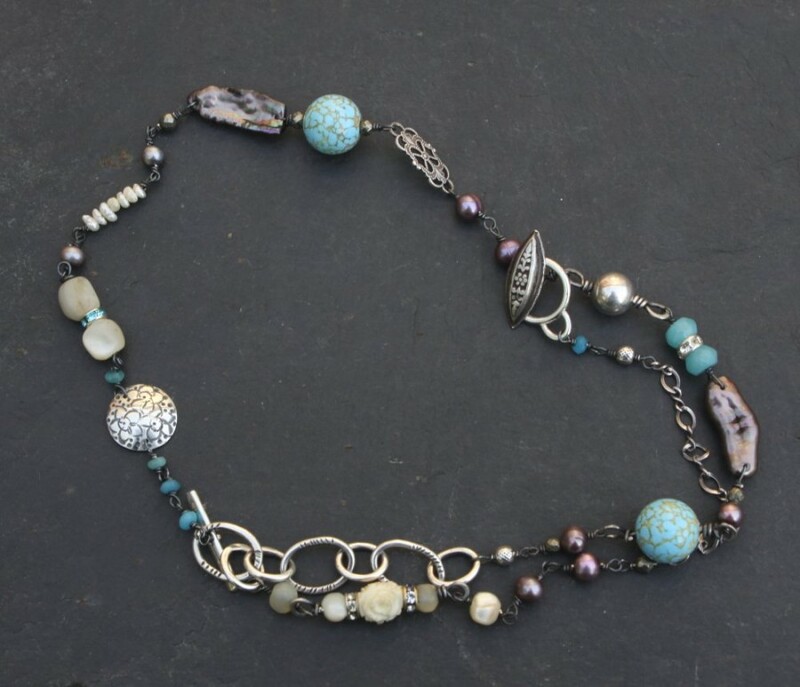 The beads are a mix of fresh water pearls, 1950’s blue ceramic beads, blue quartz and vintage carved floral bone beads. 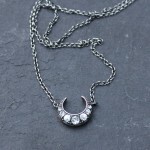 The necklace can be worn as one long length or doubled up and worn in an eye-catching shorter manner. Due to the design and positioning of the clasp the sections worn at the front can be alternated. I often find mens’ jewellery quite a challenging design brief. 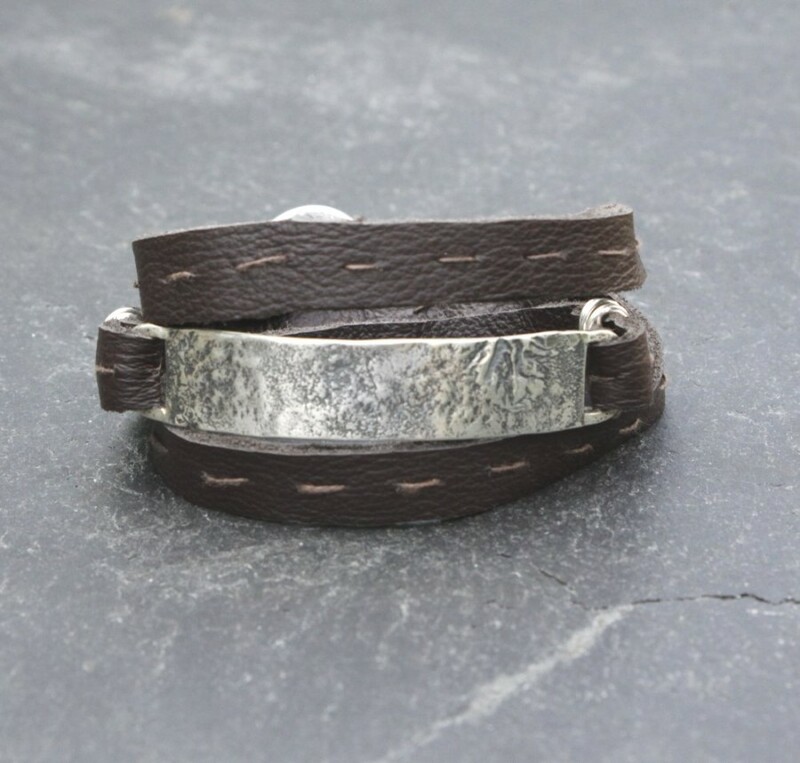 Current trends in mens jewellery can be quite austere and lack the flamboyance I often like in jewellery. However I was very pleased with the completed result in this piece. This piece was for a 30th Birthday Present. I knew the recipient would not be in need of the old standbys in male jewellery: cufflinks or the tie pin! So I wanted to create something youthful yet still classic. 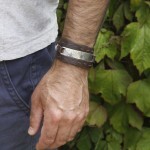 The result is a silver and leather wrap cuff. It’s quite a simple design, but with some unusual elements. The central silver bar is reticulated silver. 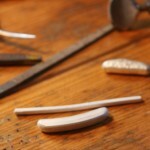 This technique gives a very textured finish to the silver, and it adds great visual interest. There is a slight curve to the bar to allow for comfort in wearing. I also stamped the back of the bar with the recipients name and date of birth. 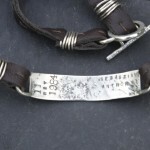 As it was for a male, I used heavier chunky silver to give a good weight to the piece. The clasp is a simple toggle design. Once again it is made of heavy gauge silver. 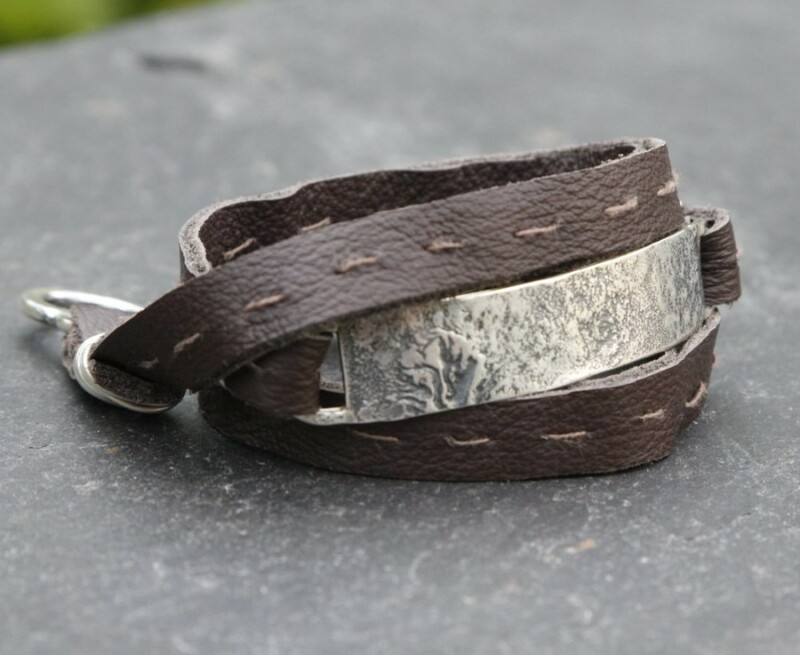 The clasp is also textured to match the front silver bar. The leather is cut as two long strips. I have then hand stitched them together with linen thread. 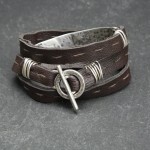 The leather is attached by looping it over the silver links, and secured with wrapped around sterling silver wire. The client & the receiver of the gift were both very happy with the piece.